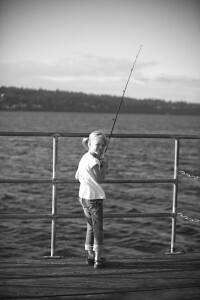 Moving north to Bainbridge Island with my husband and young daughters was an attainment of a goal for our family. We were looking for a change of pace and after our first visit to the island we were smitten with the water, the mountains, the ferry and most of all the friendliness of the community. Leaving behind family, fond memories, and city life in Northern California, we headed for the Pacific Northwest, and experienced first hand what it is like to relocate your lives with young children. Now, eleven years later, I love living and working in real estate on the island and my husband enjoys his virtually stress-free bike/ferry commute into Seattle. We selected Bainbridge as our home for many reasons, one major reason being the school district. We feel good about our kids going to safe, small, quality schools and because I primarily work on the island I can do things like volunteer in their classrooms, volunteer for Rotary, sit on school district committes, and participate with the Bainbridge Schools Foundation. I grew up in the San Francisco Bay Area and then attended UC Davis, majoring in English and Anthropology. I earned my MA in Education at Sacramento State University. After college, my husband and I lived in Davis and then eventually settled in the Land Park Neighborhood of Sacramento where we bought our first home together. My first career was teaching and writing. I feel that my ten plus years as a middle school and high school English teacher and teacher-trainer prepared me for the ever-changing world of real estate. I am a great multi-tasker, am keen on technology, have more patience than the average gal, and have the intrinsic desire to continually keep learning – especially about the world of real estate. Before moving to Bainbridge Island, I also sold real estate in the Sacramento Metro Area for two years. I admit that I am obsessed with houses and unique properties. I have the most experience working with families new to the island and I enjoy helping them make their transition to island life a successful one. What do all those acronyms mean? ABR, CNE, NAR??? I am a full-time agent who is conscientious, honest, organized, prompt, and ethical. My style is low pressure and I listen to my clients. I understand that the real estate market is an ever-changing animal. I am constantly reading and studying the market, especially the unique Seattle/Bainbridge Island niche market. I am a licensed Realtor in Washington. I am an Accredited Buyer’s Representative and a Certified Negotiation Expert. I am a member of the National Association of Realtors and the Kitsap County Association of Realtors. In short, I take a lot of classes and keep up with the current laws and trends. Yes, you want an agent who can find you the perfect house, and I sincerely enjoy that part of the job. However, I understand that you also want an agent who can construct a contract that protects your best interests. I take that aspect of the job quite seriously. As a Realtor, I respect that you are entrusting me with your time, your money, and your home. If my background, skills, and style fit your needs, I look forward to working with you. I consider living on this beautiful island a privilege. I am grateful that my profession allows me to give back to the island. After the close of each transaction, I enjoy donating a percentage of my commission to island housing, land and education non-profits. Average gifts are $500. The bulk of my donations have gone to the Bainbridge Island Land Trust, Helpline House, and the Bainbridge Schools Foundation. These donations are in addition to the per-closing donation made to the Windermere Foundation, which supports Kitsap County charities. I am grateful for my clients and I enjoy thanking them by improving the quality of life for everyone who calls this island home. If you want to know even more about me, what I do, and where I live, visit my blog, here on this site.